I was recently commissioned by editor Jordan White to create a cover that references an iconic classic Marvel cover but with the roles of The Avengers and The X-Men swapped out. 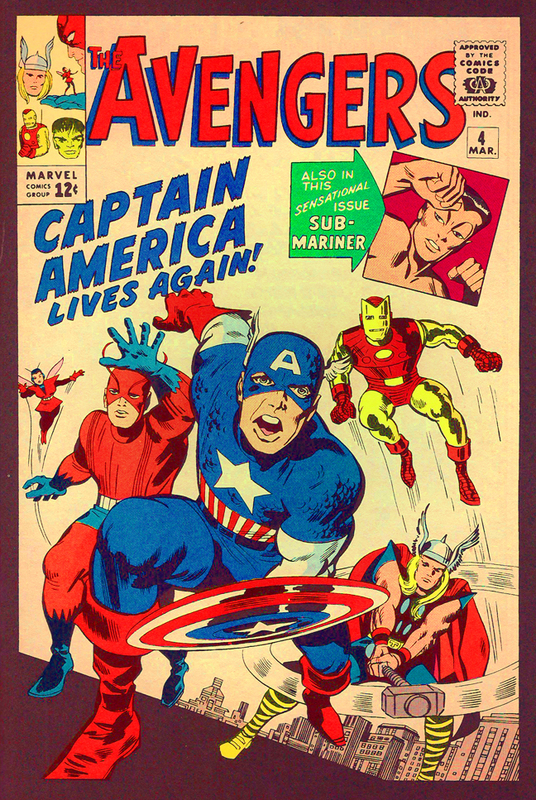 In this case, take the iconic Kirby cover for Avengers #4, which is in my opinion THE Marvel cover, featuring the return of Captain America, and replace the Avengers with X-Men. 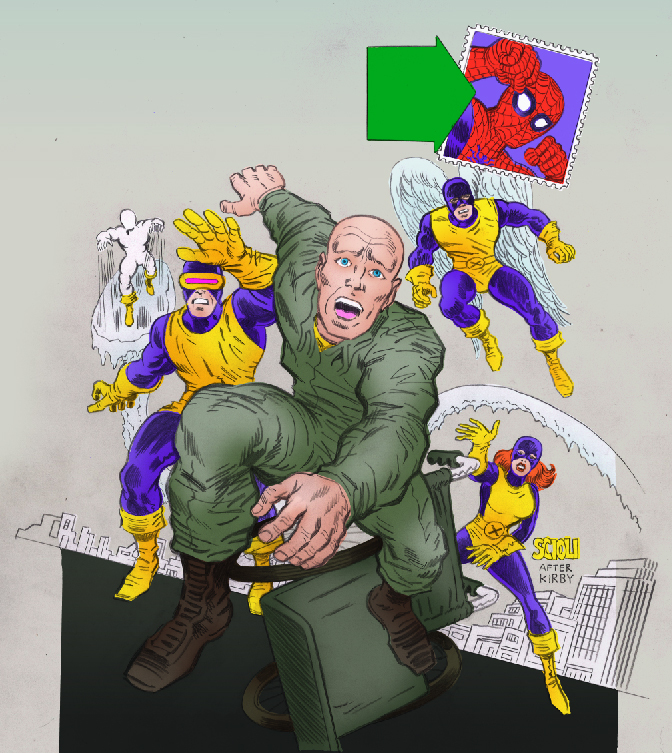 Jordan presented me with a couple of concepts to choose from, but the one we both liked best was Professor X casting aside his wheelchair and walking. Filling out the rest of the roles was easy enough. 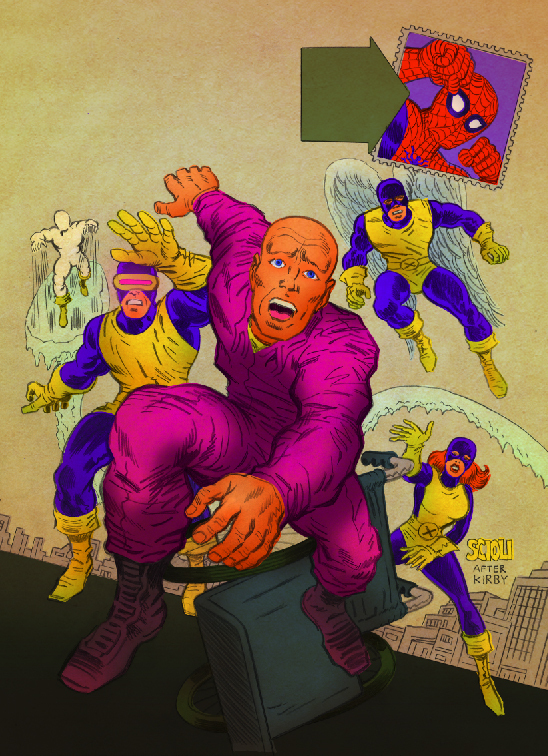 “Flying” X-Men replace the flying Avengers. Earnest Giant-Man replaced by the earnest Cyclops. Long-haired Thor replaced by long-haired Marvel Girl. I was tempted to give Marvel Girl a hula hoop, to reference the ring of motion that Thor generates by swinging his hammer, like how the wheel from Professor X’s toppled wheelchair forms a visual rhyme with Captain America’s shield. Whom to put in the inset box above was a little trickier. The Beast would’ve made sense, but in the original version it was Sub-Mariner, who was always a loner, belonging to no group at the time. I thought Spider-Man fit that role, the perennial outsider. 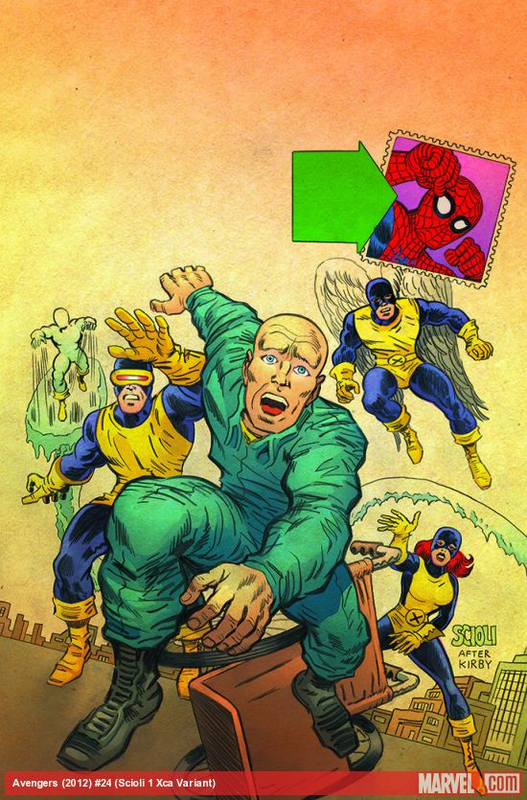 Putting Spider-Man on a cover doesn’t hurt sales, either. I added the subtle flourish of a stamp border around his portrait. I decided to use this cover as a place for stylistic experimentation. I’m trying to figure out the perfect look for Transformers/G.I.Joe. 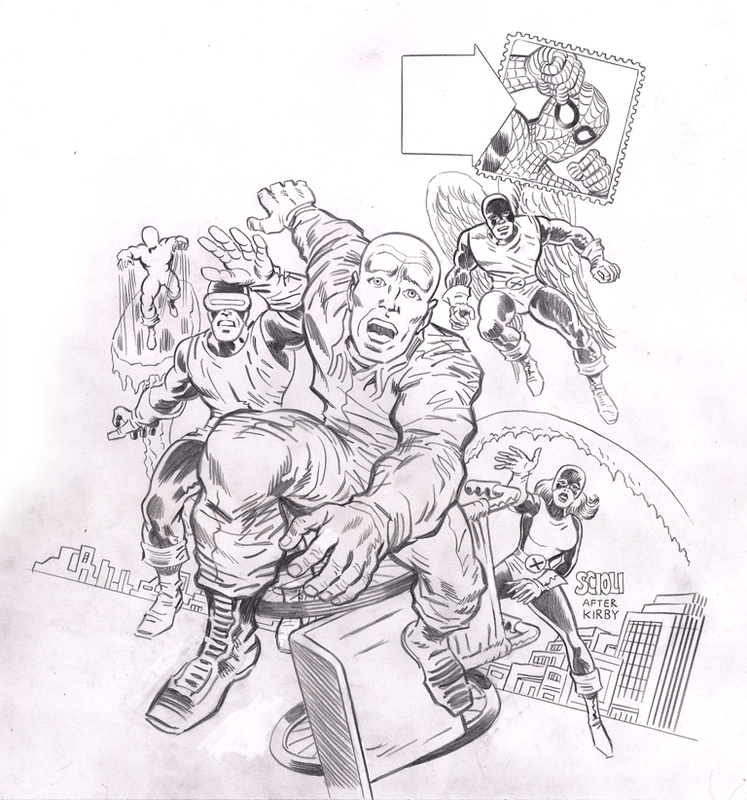 One that I’m considering, is printing directly from my pencils. Working on Satan’s Soldier for the past year, I really liked the results I was getting from intense colors over loose pencil drawing. I wanted to see what intense colors over a tight, meticulously-crafted pencil line would look like. I was commissioned to provide black and white line art, to be colored by someone else. I’d recently made the decision that going forward, even if I’m just being hired for black and white art, I’d also color it. If the client decides to keep my color, great. 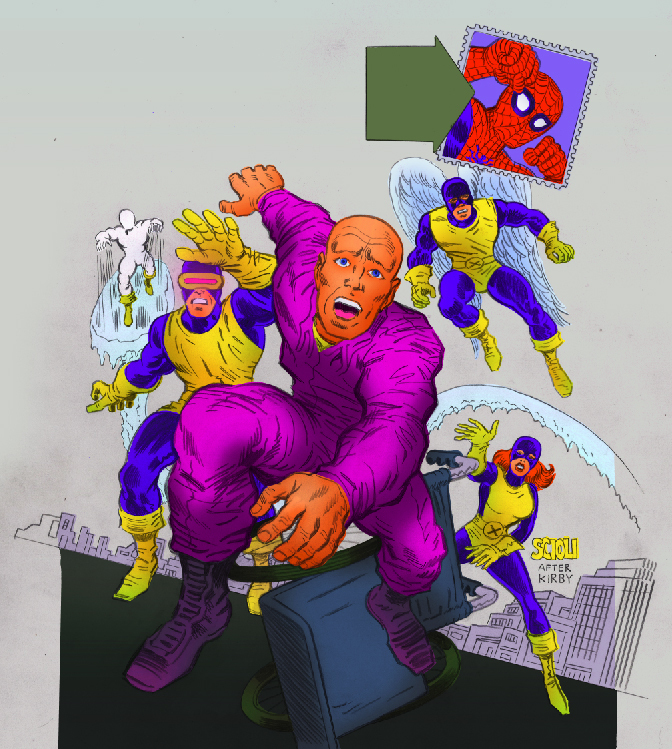 If they decide to have somebody else color it, the colorist will at least know what my intentions were for the piece. The colorist can feel free to go in whatever direction he’d want with it, but at least he’d understand what everything’s supposed to be. That’s something you can’t take for granted. Sometimes areas of overlap can be confusing. Is that an upper lip or teeth? Is that shape part of the foreground character’s leg or the background character’s arm? These things are often difficult to discern. In essence what I’ve created is at best, actual finished colors, at worst, a color guide, which many artists provide when they do black-and-white line art. I drew it in pencil, then redrew it a couple of times. Instead of inking it, I redrew it again as a pristine, blemish-free, camera-ready super-tight pencil drawing. I like the variation you get with a dark pencil line. It breathes a little more than the crisp ink line I usually use. On a separate layer, I played with the contrast to make sure that, it could be easily adjusted into a proper hard digitally-inked line if need be. Usually when somebody else colors my work, they make it less poppy, more modeled. In this instance, the colorist did the opposite. My version has soft, modeled colors, a subdued line and a somber palette reminiscent of Suydam, while the colorist went with a flatter Pop Art approach with a cheery palette and increasing the contrast on the linework. As with the Deadpool cover, I feel like the end result is stronger than my initial version. What the colorist made is richer than what I’d provided, but I can also see the influence that my guide had. Without that guide, I feel that the cover, for better or worse, would’ve been very different. I’ve been pleased with the results I’ve been getting from this approach and feel it’s worth the extra effort. I use pencils the same way, on occasion. On an old comic, there’s a lot of texture and variation in the line, places where the printing plate loses contact with the surface of the paper. I find a pencil line reproduced on glossy paper is a better approximation of that organic line.